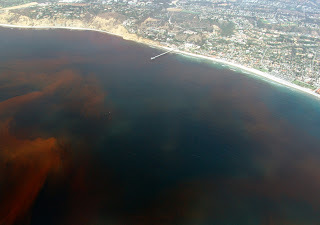 A "red tide" off the coast of La Jolla, California. Red Tide is a natural phenomenon where water banks get colored due to concentration of certain types of algae known as phyto- planktons. The excessive presence of these algae (about several millions per liter of sea water) causes dense and visible patches on water surface and hence the name red tide. This phenomenon need not always be red; it can be yellow, brown, red or even black. But a reddish tinge is generally associated with it. As red tide has no connection with tides (tides being yet another process); the word Red Tide remains a misnomer. Present day scientists mostly use the word Harmful Algae Bloom or HAB. Where the bloom is not toxic it is referred to as just algae bloom but the most preferred word still remains Red Tide. 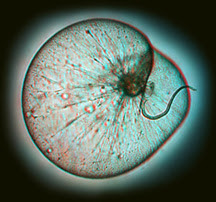 Phyto-planktons or dinoflagellates are unicellular (single celled) organisms which move wagging two hair like growths called flagella. These organisms multiply fast and their growth is determined by temperature, salinity and depth of the water where they live. Most of them are capable of photosynthesis and have colored pigmented for the purpose. Some are color less predators they dependent other animals for food. Certain species of the dinoflagellates like zoxanthellae are endosymbionts which like inside the body of corals polyps; while they produce food for the corals they get free lodging in the coral body. The strange thing with association is this that the death of the host spells the end of the guests! The Red Tide is a natural phenomenon that has been there from time immemorial but the earliest written record is believed to be that of Cabeza de Vaca the famous Spanish explorer who had written about it. Alvar Nunez Cabeza de Vaca was an explorer of the 15th century (he is known for his proto anthropological works, he is also acclaimed as the explorer of the new world). Usually nature keeps a balance among its beings if there are fast multiplying plants there will be herbivores to control them. If there are too many herbivores there will be predators to control them. Scientists have not been so far able to come with a clear explanation why these poisonous algae explode to such strength quite detrimental to other beings of the sea, which is not agreeing with the balancing of nature’s forces. Some of the hypothesis point finger towards man made as well as natural forces like global warming, the cloud storms from Sahara that dump iron rich particles etc, they are yet establish the roles played by them beyond doubt. An article on Red Tide is not complete without a reference on the Florida Tide that occurs every year as a routine during late summer or early fall. It is most prominent off Florida between Clean water and Sanibal Island. The main villain among 40 other algae which are found here is the ‘Florida Red Tide Organism’ ( Karena brevis) a single celled organism produces a neurotoxin called the brevetoxin (that causes neurotoxic shellfish poisoning or NSP)that moves wagging two whip like hairs known as flagella. They feed upon the chemical effluents from the River Mississippi and multiply fast to make the sea brown or reddish. In the Gulf of Maine located near the Bay of Fundy (which is famous for its high tides and naturally carved statues); there is yet other alga by name Alexandreum fundyence (which is also a Dinoflagellate like Karena brevis) that causes a red tide (HAB) -in 1972 these algae caused a Red Tide in New England. The toxin produced by A. fundyence make the filter feeding shellfish toxic (due to saxitoxin) leading to death of those who consume it. The usual reasons cited for all the evils of the world are global warming, disappearance of the tropical forests, holes on the ozone layer are cited for this algal bloom also. There has been one reason cited as the most prominent one is the effluents from the River Mississippi that carries the nutrients used for farming in its surrounding areas in to the sea that supply the much needed compounds like nitrates and phosphates for the rapid growth of the algae. The impact of El Nino is also cited as a strong case for the Algal bloom. This phenomenon has been in the circulation during September, 2006 with the onset of one strong El Nino. The word means ‘little boy’ meaning child Christ; as it usually affects during Christmas times in the Pacific. El Nino is prominent in the Pacific Ocean off the West Coast of South America. It was first reported in 1923 by Gilbert Thomas Walker. He also has the credit of describing the Walker Circulation yet another Pacific phenomenon which has named after him. El Nino has been said to be responsible for distributing rainfall and any upset in its course or other variations can cause excess rain fall in one place and deficits in yet another place. The name Red Tide called to this phenomenon is apt as it is a danger signal as the color red. These algae that bloom during the Red Tide are mostly poisonous and are called Harmful Algal Bloom or HAB by the scientists. These toxins contained by these algae are also of different impacts like domic acid that can cause amnesic shellfish poisoning (ASP), saxitoxin that is responsible for paralytic shellfish poisoning, brevetoxins that causes neurotoxic shellfish poisoning or NSP, okadaic acid diarrheic shellfish poisoning or DSP, ciguatoxin (ciguatera fish poisoning CFP) etc depending upon the algae. The toxins of the algae cause itching and burning of skin among swimmers; at times when the bloom is in full swing; those sit on sea shore are also affected by inhaling the toxic contents carried by the sea breeze. Deaths of human beings have been reported by consuming the shellfish infected by the algae toxins.